most thrilling and exciting manner to show you an example of driving with force in the sand popularly known as Dune Bashing. 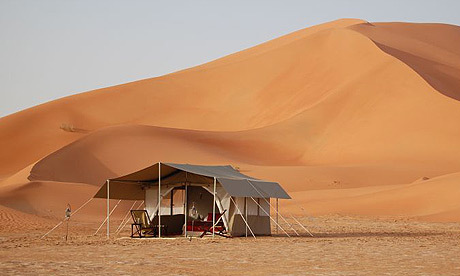 In Rub AL Khali, enjoy the exciting and thrilling driving tactics in the fine sand of Arabian Desert. Enjoy a beautiful sunset over the sand dunes before you reach our camp site. You will also have the opportunity to ride a camel. Arabian Coffee and traditional dates are also served on arrival at the camp. Later you will be served a delicious B.B.Q. dinner and Shisha (the Arabic water pipe). After the breakfast, served at the camp on the next day, we will proceed to the Lost City of Ubar(UNESCO World heritage site). This legendary ancient kingdom, known as Ubar, was said to have existed in one of the most inhospitable places on earth a vast and forbidding Rub Al Khali desert, appropriately known as the Empty Quarter. According to myth, the desert swallowed up Ubar. Quite literally, it sank without trace -becoming the fabled Atlantis of the Sands. This once buried city, which was spotted by satellite, gives you a glimpse of the value of work carried out by a team of explorers in 1982, led by Sir Ranulph Fiennes. On our return to Salalah we drive into Wadi Dawka (UNESCO World heritage site) known as the Frankincense Wadi, which is also well-known as the biggest collection of the naturally grown Frankincense trees in the region. Experience the Frankincense and its use in the past as well as in the modern World. Return to Salalah by afternoon.